Getting that garbage bag off the ground has all kinds of advantages, but sometimes, you can’t hammer sticks into the ground to make the easy three stake holder. There might be any number of reasons. The ground’s got too many rocks. The ground is rock. You’re in a parking lot or on the sidewalk during a fundraiser. You’re indoors. 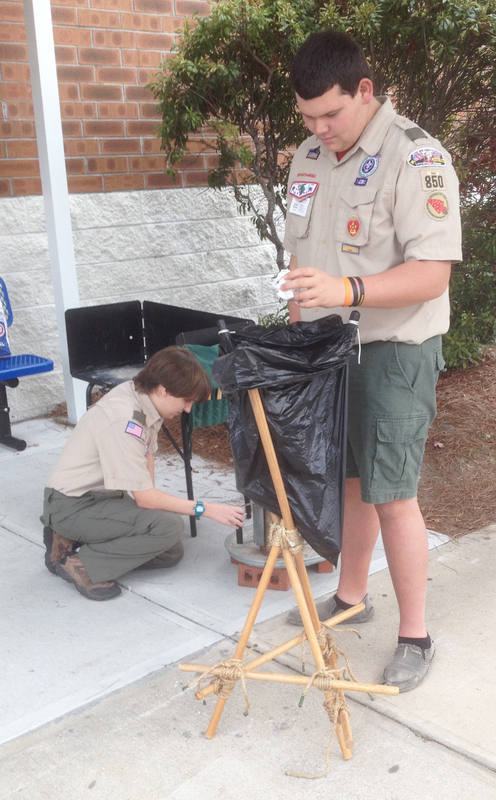 In these cases, to hold up a trash bag (when there is no trash can), you can simply lash three Scout Staves or similar poles into a tripod and lash on some short cross pieces to keep it stable. All that’s required is seven lashing ropes, one for a tripod lashing and six for square lashings. For the poles you need three 4 to 5-foot sticks for the tripod legs, and three short sticks for the tripod leg supports. Note: The tripod lashing is tied below the middle of the longer sticks. The length that the sticks extend on top of the lashing will be determined by the size of the bag your holding. Also, to secure the bag on the holder, and too shorten or lengthen the amount the bag hangs, you can fold the top of the bag as much or as little as you like over the three upper leg extensions. This is a very good idea! My mind is already thinking of how many times this would’ve come in handy. Great Website!